Disability is difficult to define and interpret. Some are born with disability and some acquire it later in life. It is an umbrella term covering impairments, activity limitations, and participation restrictions. Impairment is a problem in body function or structure, activity limitation is the difficulty encountered by an individual in executing a task or action, while participation restriction is the problem experienced by an individual in involving in life situations. The groups in our society that are primarily affected with dental disease are children, disabled individuals, low income, minority, migrant population and the elderly. People with disabilities face discrimination on various accounts: Due to their physical disability, behavior and attitude of the society at large and on socio-economic grounds. As regards to their health, disabled persons themselves have low level of expectation from the health profession. Oral health is often accorded the lowest priority in the context of overall health and therefore, oral health of the disabled person is neglected in view of both these factors combined together. There is evidence that the mechanical control of plaque prevents gingivitis and reduces plaque. Thus, tooth brushing continues to be the most used and effective method for cleaning most tooth surfaces. Tooth brushing, like all habits of hygiene, is acquired during the socialization process of a child. When this habit is taught in early childhood, it is naturally ingrained in the daily routine of the child, with only positive reinforcement needed later. Preventive dental care is essential at institutions for the hearing impaired and mute population because of the high incidence of dental and periodontal disease in them. Because many of these individuals are unable to maintain good oral hygiene independently, the educational component of preventive dental care must be directed toward the parents and caregivers. Hence, the objective of the study was to evaluate the effectiveness of supervised tooth brushing in improving the plaque levels and gingival status in a school for hearing impaired and mute children. The present study was a single-blind, parallel-design, randomized controlled clinical trial carried out in a government institute for hearing impaired and mute children in Jaipur, Rajasthan, India for a period of about 6 months. The period of 6 months was required to evaluate whether supervised tooth brushing has a prolonged effect on the oral hygiene improvement. Before scheduling the present study, the required ethical clearance was obtained from the Research Review Board, Jaipur Dental College to conduct the study and permission was taken from the school principal. All children whose parents or caregivers granted consent and who cooperated on the day of examination were included in the study. Those who were absent on the day of examination, who did not give consent, who were having congenital anomalies and who were on medication or required emergency dental treatment were excluded. Random allocation was made in blocks in order to keep the sizes of intervention groups similar. A sample size of 315 that is divisible by the block size was chosen. The students were divided into three blocks/groups: Group A included resident students (105), who underwent supervised tooth brushing under the supervision of their parents. The non-resident students were further divided into two groups: Group B and Group C. Group B children were under the supervision of caregiver, who assisted and helped the subjects address their difficulties. Group C children were under the supervision of both investigator and caregiver. The investigator instructed the caregiver and monitored the health outcomes. Just before the clinical examination, students were shown a 10-min video which depicted the procedure of application of disclosing agent and recording of indices in a young patient. It was done in order to relieve the anxiety and for a better understanding of the entire procedure. During the clinical examination in the school, the children were accompanied by the respective class teachers and the non-resident students by the caregivers who also acted as the interpreter. The plaque disclosing agent was applied using cotton tips. After the application of the disclosing agent, the subjects were evaluated by the same examiner for the disclosed plaque and the plaque and gingival scores were recorded by the same examiner throughout the study period. Plaque Index (Turesky Modification of Quigley Hein Plaque Index, 1970) and Gingival Index (Loe and Silness, 1963) were recorded at baseline, 3 weeks and 6 weeks. Prior to the study, the investigator with the help of the teachers had explained the purpose of the study to the students with the help of sign language. Oral health education was provided to the school children using visual aids in the form of an attractive presentation with animations and cartoons delivering interactive oral health care messages. The 10-min video depicted various diseases affecting the oral cavity, the ill-effects of bad oral hygiene and tooth decay, importance of tooth brushing, and correct methods of tooth brushing. Attractive and colorful flip charts explaining various oral diseases and importance of balanced diet were also shown. Teachers were also involved in the health education sessions and were encouraged to take part actively in motivating the students. If the students had any queries, they were asked to write their questions on blackboard and the investigator answered the doubts and teachers conveyed it with the help of sign language. Children were instructed to brush their teeth twice a day with fluoridated toothpaste using roll-on technique. Roll-on technique was chosen as it is easier to learn and less time consuming for the hearing impaired and mute children, as compared to other complex tooth brushing techniques. Tooth brushing technique was taught to the children in small batches with the help of video demonstration and roll-on technique for tooth brushing was taught on dental models for better understanding. Each child was given a new toothbrush and toothpaste at the beginning of the study. The children were asked to brush at least twice a day, in the morning and evening. A pamphlet containing pictures depicting the correct method of tooth brushing and instructions for the parents was printed; the instructions were to use a pea-sized amount of the toothpaste, method of cleaning and storage of toothbrush and not to share the toothbrush with the other family members. On the overleaf of the pamphlet, a planner was given in which the students were asked to put a tick mark whenever they brushed their teeth as well as to mark the timings for tooth brushing and the parents were instructed to keep a watch on the child's day-to-day planner. A notice was sent to the parents of non-resident students inviting the parents for oral health counseling during the school hours. Days for oral health education were pre-fixed with the principal of the school. The parents and caregivers were explained about the program and the importance of maintaining proper oral hygiene. Oral health counseling was provided by the investigator with the help of models and charts and focused on the structure and function of teeth, type of dentition and also the importance of balanced diet and the influence of oral health on general health. Caregivers and parents were trained to supervise the tooth brushing program, correct method for tooth brushing, infection control procedure and record keeping was explained. The parents were also instructed to monitor the planner regularly. The oral health counseling session was repeated at an interval of 3 weeks for the reinforcement of oral health instructions. The parents were invited for the oral health counseling sessions by sending letters with the children; those who were unable to come were given instructions telephonically and were requested to follow the supervised tooth brushing regimen. Reinforcement of oral health education was a source of motivation and was used to arouse the interest of the parents/caregivers and children toward the success of the intervention. Investigator-supervised tooth brushing was performed twice a week in both the hostels. The days and timings for supervised tooth brushing were fixed with the caregivers of the resident students. The investigator along with the caregiver supervised the children during tooth brushing. A clean area with adequate supply of water was chosen to carry out supervised tooth brushing. The children were taught to brush their teeth according to roll-on technique and were encouraged to perform oral hygiene practices. Individual assistance in brushing was provided and the child's daily planner was also evaluated at regular intervals. Children were encouraged and praised for performing well in oral health related activities, which was a source of motivation for improvement in skills. No professional prophylaxis was performed and the subjects were re-examined for clinical scoring at the end of the program. The data were entered into a database using Microsoft Excel 2007 spreadsheet and analyzed using statistical software. Chi-square test was used to test differences in frequencies between groups and for testing association. One-way analysis of variance (one-way ANOVA) was used to test the differences in the mean plaque and gingival scores of the three groups. Significance of P value was taken at < 0.05. The study participants comprised 105 students in each of the three groups. The percentage of students in the age group 6-10 years was 13.3%, 11.4%, and 20% in Group A, Group B, and Group C, respectively. In 11-15 years age group, the percentage of participants was 43.8%, 38.1%, and 44.8%, respectively. There were 42.9%, 50.5%, and 35.2% participants belonging to the age group >15 years in Group A, Group B, and Group C, respectively [Table 1]. Out of the total 214 males, 68.6% were in Group A, 71.4% in Group B, and 63.9% in Group C. The total number of females was 101, of which 31.4% were in Group A, 28.6% were in Group B, and 36.2% were in Group C [Table 2]. Mean plaque scores at the baseline examination were approximately same for Group A and Group B. The mean plaque score at baseline for Group C was 1.48 ΁ 0.90. Compared to the baseline findings, there was an average reduction in plaque score during the subsequent second follow-up conducted after 3 weeks of the start of study and in the final follow-up at 6 weeks [Figure 1]. The groups were well balanced in terms of gingival inflammation status at the baseline examination. 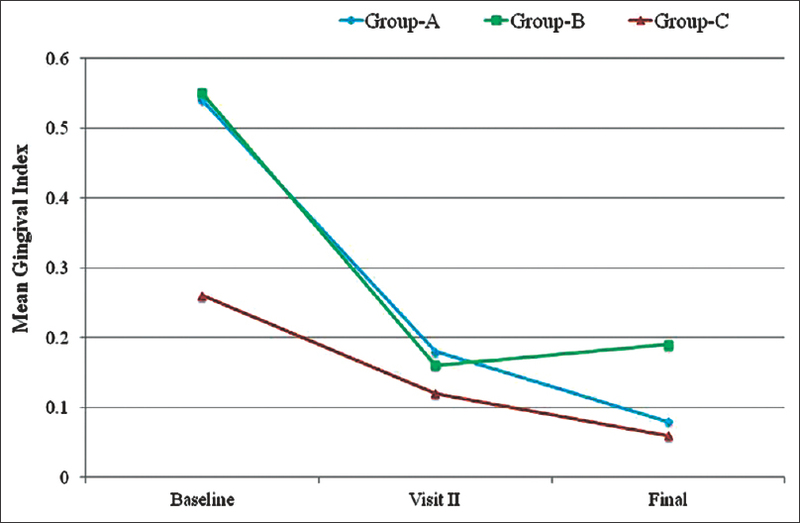 During subsequent visits, there was marked reduction in the gingival index scores in all the three groups [Figure 2]. One-way ANOVA was applied to know the difference in plaque index from baseline to final examination. The test revealed the changes in plaque scores were not significant when the values were computed from baseline to final examination [Table 3]. The change in gingival index scores from baseline to second follow-up was highly significant (P < 0.001). Group B was superior as compared to the other two groups [Table 4]. The comprehensive overview of the methodology of the study is presented in [Figure 3]. In a supervised tooth brushing program at the school for non-institutionalized children with mental retardation with or without Down's syndrome, the prevalence of severe gingivitis was lowest and better periodontal health was evident among those who had their teeth brushed every day under the supervision of a teacher. Highly significant improvement in gingivitis was observed in institutionalized children. Improvement seen in the present study as healthy gingiva with comparatively less changes in dental plaque may indicate an increase in the frequency of tooth brushing, but not its quality. However, a small reduction in plaque score seemed to improve gingivitis scores. Gingival bleeding follows plaque colonization and maturation; even unskilled tooth brushing may lead to a decrease in bleeding despite some remaining plaque. Significant changes in the mean plaque and gingival index scores were observed in all the three groups of the present study. The reason for this improvement was that children with special needs were given personal attention in the form of supervised tooth brushing, which made them more interested in maintaining oral hygiene. The finding of the present intervention was contradictory to a study  in which the change in mean plaque scores was found to be significantly greater than the corresponding change in all other groups. This study revealed that a school-based intervention approach is effective in improving the gingival health of hearing impaired and mute children with poor oral health at baseline. Marked improvements were observed in the intervention outcomes among the children under who were under their parents' supervision, reflecting high compliance of the parents and their increased interest toward oral health education. The present intervention demonstrated that children with impairments can be instructed about simple oral hygiene procedures and they can carry out correct tooth brushing when given encouragement and motivation. It can be concluded from the present study that a program of teacher and parent supervised toothbrushing with fluoride toothpaste can be safely targeted to socially deprived communities and it can enable a significant reduction in plaque and gingival scores. Both comprehensive and incremental dental care are recommended for these subjects in special schools in order to improve their oral health with the cooperation of local dental institution, parents, school authorities, voluntary organizations and the government. The implemented program suggested a positive impact of supervised tooth brushing on the oral hygiene status and gingival status of the children. Non-institutionalized children showed marked improvement in the oral health conditions as they were performing tooth brushing under the supervision of their parents. These results are indicative of developing preventive dentistry programs for the children with special needs and also training the parents and caregivers in providing proper oral hygiene for the disabled children. The study highlights the benefits of home-school liaison to promote the gingival health of the children with special needs. A follow-up study is required to investigate the maintenance of this effect and to what degree the motivation and willingness to maintain tooth brushing routine continues after the termination of the program. Glassman P, Miller C, Wozniak T, Jones C. A preventive dentistry training program for caretakers of persons with disabilities residing in community residential facilities. Spec Care Dentist 1994;14:137-43. Shyama M, Al-Mutawa SA, Honkala S, Honkala E. Supervised toothbrushing and oral health education program in Kuwait for children and young adults with Down syndrome. Spec Care Dentist 2003;23:94-9. Oredugba FA, Akindayomi Y. Oral health status and treatment needs of children and young adults attending a day centre for individuals with special health care needs. BMC Oral Health 2008;8:30. Leal SC, Bezerra AC, de Toledo OA. Effectiveness of teaching methods for tooth brushing in preschool children. Braz Dent J 2002;13:133-6. Stefanovska E, Nakova M, Radojkova-Nikolovska V, Ristoska S. Tooth-brushing intervention programme among children with mental handicap. Bratisl Lek Listy 2010;111:299-302. Leous P, Palianskaya L, Leous L. Oral hygiene and gingival inflammation in 6-8-year-olds from a junior school in Minsk who participated in a Supervised Oral Hygiene Programme. Oral Health Dent Manag 2009;8:27-30. Pine CM. Designing school programmes to be effective vehicles for changing oral hygiene behavior. Int Dent J 2007;57:377-81. Nicolci AB, Tesini DA. Improvement in the oral hygiene of institutionalized mentally retarded individuals through training of direct care staff: A longitudinal study. Spec Care Dentist 1982;2:217-21. 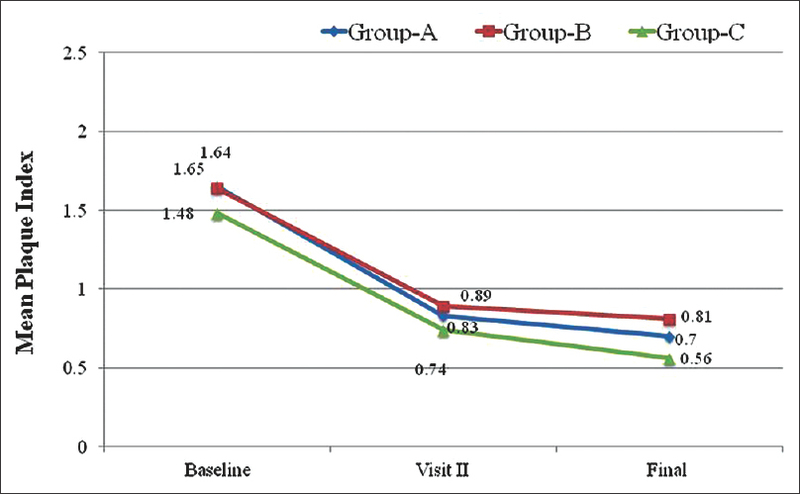 Saied-Moallemi Z, Virtanen JI, Vehkalahti MM, Tehranchi A, Murtomaa H. School-based intervention to promote preadolescents' gingival health: A community trial. Community Dent Oral Epidemiol 2009;37:518-26. Moysés ST, Moysés, SJ, Watt RG, Sheiham A. Associations between health promoting schools' policies and indicators of oral health in Brazil. Health Promot Int 2003;18:209-18. Emler BF, Windchy AM, Zaino SW, Feldman SM, Scheetz JP. The value of repetition and reinforcement in improving oral hygiene performance. J Periodontol 1980;51:228-34. Rong WS, Bian JY, Wang WJ, Wang JD. Effectiveness of an oral health education and caries prevention program in kindergartens in China. Community Dent Oral Epidemiol 2003;31:412-6. Vigild M. Prevalence of malocclusion in mentally retarded young adults. Community Dent Oral Epidemiol 1985;13:183-4. Lindhe J, Koch G. The effect of supervised oral hygiene on the gingivae of children. J Periodontol Res 1967;2:215-20.